Our cabin was built on plans that I had in my head for the 22 years that I served in the Army. It finally became a reality in 2009/2010, when I retired and we built our dream cabin in the Wet Mountains overlooking the 14,000'+ Sangre de Cristo mountain range in south-central Colorado on land I had bought years before after a backpaking trip with the kids. Our cabin was built for our relaxation (my wife is still active duty) and our children's enjoyment. I need mountains, and there's a mountain view out of every single window in the cabin; north, south, east and west. The kitchen is fully stocked with all the latest appliances and utensils. The bedrooms are furnished with log beds that accent the cabin feel. The cabin is gently heated with in-floor radiant heat on the first and second floor, electric baseboard heat in the basement. The sauna is perfect for relaxing after a long day's hike. It's lined with redwood, heats quickly, easily seats several adults, and has a changing area nearby. The master bedroom has a beautiful east-facing exterior balcony overlooking the Wet Mountains for enjoying a coffee in the morning, while the master bath has a double-slipperfoot tub, glassed in shower, and unique handcrafted vanity from Tennessee with granite countertop and vessel sinks. The main floor bath has a rain shower and heated air jets in the tub. The loft has a 52 inch plasma TV for watching DVDs or the many VHS tapes we have of popular family movies, while the kid's playroom in the finished basement has a 32 inch LCD TV with DVD player. The 700+ sq ft of covered porch allows you to sit and watch the wildlife in the morning and evening, take in a passing thunderstorm on a summer afternoon, enjoy the hummingbirds at the feeder, and relax and watch the red sunsets over the Sangres in the evening on the Adirondack chairs. The nearby cute mining/ranching town of Westcliffe has a grocery store, bowling alley, lots of antique stores, art galleries, restaurants, some nice grassy parks and a great playground for the kids, and a Wednesday Farmer's Market on Main St where the locals bring their goods to sell (don't miss the Amish baked goods, especially the large cinnamon rolls). Westcliffe is located in the Wet Valley, which is sparsely settled with very few lights; you will see more stars at night than you had ever thought possible. Of all the places we have lived in the world due to our Army careers, the nights at our cabin were the first time our kids saw the Milky Way galaxy. At the cabin it was easy to teach our kids how to locate the North Star using the Big Dipper, and using a star locator, we have found all the northern constellations, and several of the planets. A short while after sunset it is also possible to see satellites moving overhead, if you know how to distinguish them from aircraft. We have 15 acres to roam on, with thousands more acres of National Forest and Wilderness Areas just a short drive away. The 100 mile Rainbow Trail along the front of the Sangres, and the trails into the Sangre de Cristo Wilderness can provide the most adventurous with days of glorious hiking. There are valley and mountain lakes for fishing and kayaking, with world famous Arkansas River white water rafting in the Bighorn Sheep Canyon a half-hour's drive to the North, or Class 6 rafting, ziplines and bungee jumpming through the Royal Gorge. At the Wolf Springs Ranch, there's a bison herd and Mission Wolf, a wolf sanctuary; both a half-hour's drive to the south. Your kids can play on our big treehouse that features a cargo net climb, and monkey bars. Day trips can take you to the Great Sand Dunes National Park, the US Olympic Training Center in Colorado Springs, Pikes Peak, the River Walk in Pueblo, the hot springs at Salida, the ghost towns of St Elmo, Tincup and others, Royal Gorge, Bishop's Castle, the historic mining towns of Rosita, Victor and Leadville (the highest incorporated town in North America) the mining/gambling town of Cripple Creek, the Gold Belt Tour roads, Mount Princeton Hot Springs, Joyful Journey Hot Springs, Garden of the Gods Park, and the Air Force Academy. There are literally thousands of miles of paved and dirt mountain roads, clothing optional hot springs in the San Luis Valley, and hiking trails up 14,000+ foot mountains. But don't let the many activities fool you, the cabin is in a very sparsely populated, but beautiful, valley. Located on a well-maintained dead-end dirt road, there is very little traffic that goes by the cabin. There is a cell phone tower on the mountain nearby, so that you have some communication with the outside world if that is what you want, as well as a satellite internet connection (if you are unfamiliar with satellite connections, they are slower than broadband). But the cabin will make you want to shut off the phone and just sit and relax. 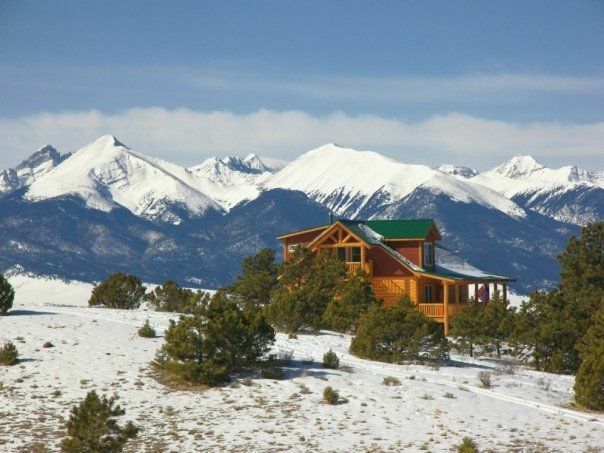 Keywords: Relax at our cabin, with top of the line kitchen, beautiful 360 views of the Sangre de Cristo Mountains and Wet Mountains in South Central Colorado. Sit on the large covered porches as you watch the deer and other wildlife graze on the land, or listen to the coyotes call at night. Play in the treehouse, relax in the sauna, or just let the stress of life disappear in our mountain retreat. Whether using the double slipperfoot tub with a view, watching movies on the plasma TVs in the loft or kid's playroom, cooking in the beautiful new kitchen, using the large sauna, or just relaxing on the porch, there is enough luxury in our cabin to keep everyone in the family satisfied. Minimum 2 night stay, Maximum two week stay. We are an Army family. I did 22 years in the Army before retiring, living all over America and the world. We have four children, all who love being at the cabin when we can make it. While there, we enjoy hiking, biking, backpacking, fishing, cooking and just plain relaxing. We love the Wet Valley for the views we get of both the Wet Mountains (the cabin is at 8600' in the Wet Mts) and the Sangre de Cristo Mountain range to the west. During the spring, the views are of lush green grasses and leaves. The summer brings afternoon thunderstorms over the Sangres and through the valley, and we often sit on the porch and watch the lightning as it passes by. The fall turns the valley golden as the ranches bring in the hay, and the aspens that fill the mountainsides turn yellow beneath the snow-capped peaks. In the winter we get snows that only occasionally are heavy at the cabin, but are massive further up the two mountain ranges to the east and west. The Wet Valley is sparsely populated, and mostly cattle ranches. You will occasionally see the local Amish families taking their horse-drawn buggies into town to purchase items or sell their home-made items at the Farmers Market on Wednesday. The town of Westcliffe has a cute downtown section with lots of specialty stores, mining, railroad and ranching history and a summer rodeo that is a lot of fun to watch. The town still has an Independence Day parade that reminds me of those I saw as a child; where every man takes off his cowboy hat as the flag goes by. We wanted our children, world travelers due to our many overseas postings, to know what small-town America really looks like, and Westcliffe is a perfect example of that. This area is one of the last remaining parts of Colorado that has not changed very much in the last 100 years. You can look at pictures of Westcliffe from the mining days of the early 1900s, and you'll see the same buildings on Main Street then as you see today. If you have an interest in viewing the night sky in all it's glory, this is the valley to do it in. In March of 2015, Westcliffe was designated a Dark Sky Community, the ninth such community in the world to be awarded that designation by the International Dark Sky Association. toilet, tub, shower, The Master Bath has a shower enclosure and a clawfoot tub. toilet, There is a half bath in the basement by the sauna. The cabin has a 360 degree view, with mountain views out of every window in the cabin. To the east is the Wet Mountains, the south shows the Spanish Peaks, the west view is of the Sangre de Cristo mountains, and to the north is the Presidential Range. If your phone can call over the internet, you are good. Otherwise, some phones get bars, others don't. My Verizon phone gets two bars here. Two propane fireplaces. One peninsula fireplace in living room, one two-sided fireplace between master bedroom and master bath. We have an internet connection now. It is satellite, so not as fast as most areas with hardwire. Satellite internet with WiFi router. Slower than what you may be used to if you have normal broadband. Both a drip coffee maker and a Keurig. We have two flat screen TVs. A 52' tv with a DVD/VHS player in the loft with several VHS movies to watch, and a 32' tv with a DVD player in the kids' playroom in the basement. Wi-Fi and Aux stereo in the living room. Lots of family oriented VHS tapes and DVDs. VHS/DVD player for the loft TV, DVD player for the kids' room TV. There is a small balcony porch off of the second floor master bedroom that faces east to catch the morning sun. I have a one-person kayak you are welcome to use. The hand-built canoe is retired, and for decoration only. The cabin has both a north and west facing covered porch. The west facing porch is best to watch the sun go down over the 14,000' Sangre de Cristo mountains. Several Adirondack chairs for your use. We have a redwood dry sauna that will fit several adults. Our family had a wonderful vacation in this beautiful cabin in the mountains. Our GPS was very helpful in finding our way to the cabin, which is about a 25-30 minute drive from the main town of Westcliffe. The cabin is beautiful and has incredible views of the mountain ranges all around. Additionally, this has to be the best stocked kitchen I have ever come across in a rental cabin. Additionally, this cabin weathered one of the most intense blizzards that has ever hit Colorado (according to the news) without any issues. It was literally a winter wonderland. The ONLY problem that we had was getting snowed in after the blizzard. We didn't drive anywhere until the day we checked out following the blizzard. The surrounding roads were plowed but the long driveway to the cabin was not, despite requests to the property manager to plow it (we were told that it would be plowed if there was more than 6 inches of snow; there was over 8 inches). We ended up getting stuck in the snow on our drive down the driveway. This was partially our fault for not having the best vehicle as the car rental company that we used failed to give us an all wheel drive car as they had promised, but could have posed a major problem had we not been saved by the incredible kindness of a neighbor who just happened to drive by and stopped to help us (Bromlin who literally saved us by driving out a path in the driveway with her Jeep and then helping us get our car unstuck from the snow). She completely saved our vacation. However, I would suggest that in the future, it would be best to err of the side of safety and plow the snow in the driveway if there is a question about guest being able to safely maneuver it due to the weather. Beautiful place and great service ,I will definitely back again with my family!!! You are welcome back, any time! We are glad you had a great stay. We really enjoyed our stay. It was perfect for our family of 5! We will be back! We are so glad you enjoyed your stay. You are welcome to come back any time. Incredible views and peaceful lodging. Handsome home. We love Westcliffe more and more with every visit. This home offered spectacular views of the Sangre de Cristo mountains. The home was super cozy and beautiful. Heated floors made for very comfy evenings while snow covered everything on the outside. Love this place and want to come back. We are so glad you enjoyed your stay. You are welcome back any time. This is a beautiful and relaxing place for a vacation! The house is perfectly designed for enjoyment of the surrounding mountain scenery. We especially enjoyed watching birds and wildlife from the wrap-around porch, and we were treated to spectacular sunsets every evening. The house is extremely comfortable and well-designed; kudos to the owners for creating such an enjoyable place. We are so glad you enjoyed your stay. Thank you for the wonderful review. The sunsets have always been a particular enjoyment of mine, and I do hope you got to see the multitude of stars each night. You are welcome back, anytime. Our stay was effortless, everything listed was available and ready for us. If you want to relax, this is the place for that, and a view to match. Depending what activities you are wanting, it may take an hour or two drive to get there, but the rental itself was awesome. Thank you! We are glad you enjoyed your stay. Minimum of three nights per rental. Maximum two week stay during the months May to September. Maximum of one month stay during off season, October to April. Contact us for pricing. Pets are not allowed, as our son has an allergy to pets.